Galeria Monarca, located at 156 E SUR Lazaro Cardenas, Bucerias, Mexico. Mural by artist Adrian Takano. Welcome to Galeria Monarca, located in the heart of the Bucerias Art District, Bucerias, Mexico, just 20 minutes north of the popular vacation destination Puerto Vallarta. Come explore the unique artwork of artist Sandra Nitchie, who draws deep inspiration from the culture of Mexico and the tropical surroundings of the Bay of Banderas. 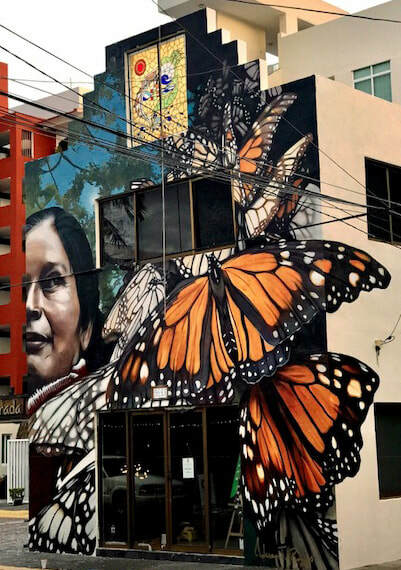 Galeria Monarca, named for the famous monarch butterflies that migrate annually, some flying over 3,500 miles from as far north as Canada to the high mountain area of central Mexico. Sandra chose this inspiring butterfly as a symbol for the profound transformation she has made becoming a full time artist and gallery owner in the beautiful beach town of Bucerias, Mexico. Browse amongst the many paintings of La Catrina, Sandra has found a resonating muse from the well known icon of the annual Mexican holiday, Day of the Dead (Dia de los Muertos). To learn more about the fascinating story of La Catrina visit the About page. Recently added to the gallery are photographic images of her travels in Mexico from San Miguel de Allende to Guanajuato and beyond. Bring home an original painting or a signed canvas print. You may also order canvas prints in various sizes from the Web Store. In Galeria Monarca you will also find charming jewelry designed by Paula Ramnaught, as well as decorative pillows and T-shirts by Luna, elegant wood sculptures and hand crafted Huichol art by local native american artists, greeting cards, table coasters and much more! Every Thursday evening from the beginning of November through mid April from 7 pm - 9 pm visit us on the Art Walk along with other local galleries that open their doors celebrating the Bucerias Art District. The Art Walk is an opportunity to meet local artists, hear their stories and understand their art. Galeria Monarca offers light refreshments and plenty of cheer! Find us at 156 E SUR Lazaro Cardenas, Bucerias, Mexico just in front of Suites Costa Dorada, ​20 minutes north of the Puerto Vallarta airport.